The usual mixture of history has been interspersed between bouts of the job I must not mention over the last few weeks. Said job involves putting in an expense claim. I had carefully preserved my receipts from descending to the recycling pile by balancing them on top of my printer’s paper tray. 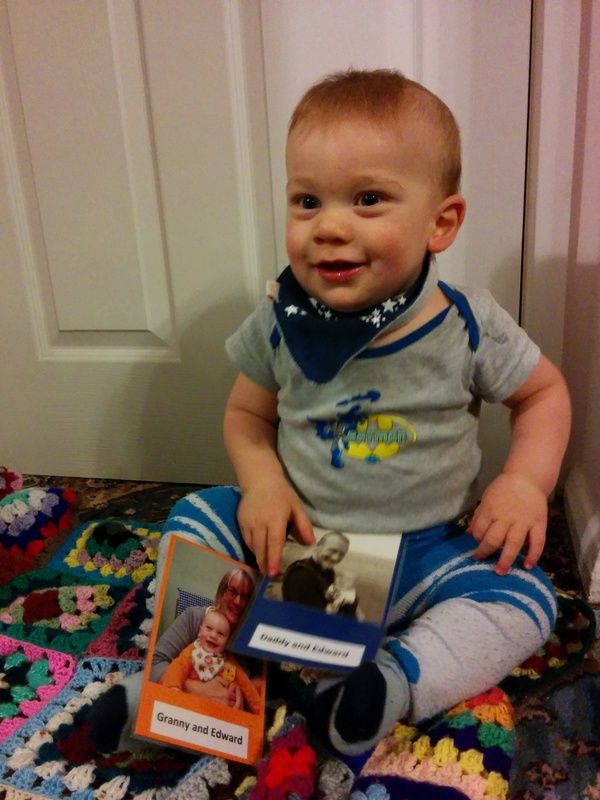 That would have been fine had I not decided to print out pictures of my grandchildren for a relative. I wonder if the fact that my receipts are now emblazoned with pictures of small children has anything to do with the tardiness of the repayment? 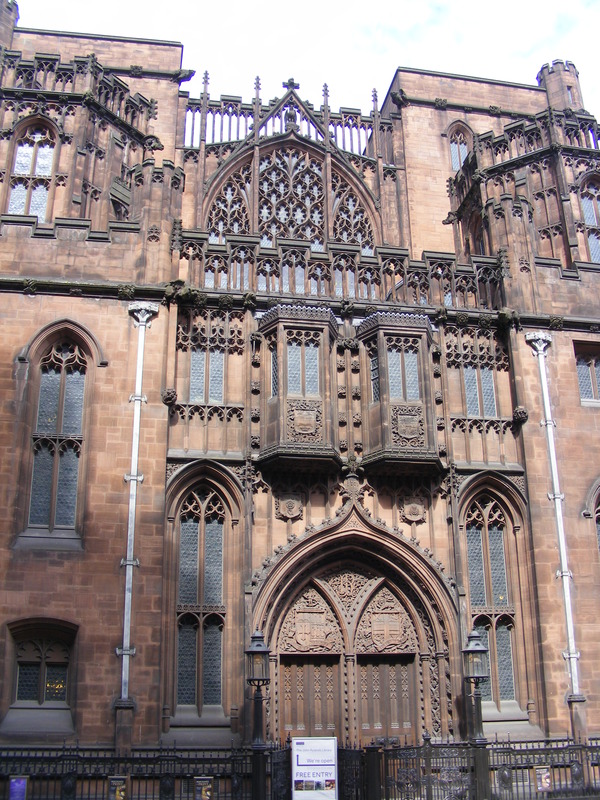 The visit to the industrial north, that is part and parcel of the mystery job, gave me an opportunity to visit the John Rylands Library. A wonderful place but just a pity that the need to order documents in advance is not made clear on their website – even mentioning it in teeny tiny print would help. We threw ourselves on the mercy of the twelve year old (it isn’t just policemen who get younger) behind the desk and documents were eventually produced, while we clock-watched – very much aware of the horrendous parking charge that we were racking up. The place is a treasure trove, I need to spend a week, a month, whatever. Next year I will (I will) be concentrating on my Bible Christian emigrants’ research and I managed to get copies of some beautiful photographs. I did have to convince the twelve year old (having explained to them how their catalogue worked) that a picture of someone who died in 1894 came into the category of being photographed by someone who is dead but hey – maybe there are some very precocious 111 year olds out there. We nearly did not escape from the multi-story car park following this visit. After several circuits following exit signs that clearly did not lead to anything resembling an exit, we tried enquiring of fellow car parkees. ‘I bet you didn’t have a beard when you arrived’ quips one wit, observing my hirsute companion – actually one of the funnier beard comments that he has had, just a shame they didn’t know the way out either. The same trip north allowed us to visit the Derbyshire plague village of Eyam. Eyam House was a delight and what better than to witness the rehearsal of the annual street performance of ‘The Roses of Eyam’. What more could a seventeenth century lover want? I have also participated in a Hangout-on-air on Three-dimensional One Place Studies, which gave rise to some amazing coincidences, there may be more about this if the story develops. Work on compiling the book about life between 1946 and 1969 is now coming on really well. The role of my lovely volunteers is all but over and it is now down to me. The book has a cover design (still under wraps), five (of ten) chapters ready for the publisher and a proper title, ‘Remember Then: women’s memories of 1946-1969 and how to write your own’ (okay I know it is a mouthful.) The book and chapter titles are all songs from the period. It is still possible that this may be ready for Christmas – I am doing my best and am really enjoying it. A book that is finished is The Ones That Got Away: tracing elusive ancestors who move into, out from and within Britain (I know, I love colons and wordy titles but I have avoided alliteration this time). It is also an ebook. It will shortly be available via UK and Canadian outlets as well. This is just in time for my Baltic Cruise – getting very excited about that now. I still have no cocktail dresses, or indeed room for many clothes at all as my seventeenth century attire takes up most of my suitcase. We do at least finally have permission to take instruments of torture a.k.a. Master Christopher’s barber surgeon kit on board. We have however had bizarre conversations in the pursuit of public liability insurance. Me: ‘Well, we check swords and bladed tools to make sure they are blunt’ (thinking ‘how on earth are they going to un-blunt themselves?’). Insurance company: ‘That’s not sufficient, we need to know that they can’t injure anyone’. Flippancy clearly does not pay; the quote came back three times higher than anyone else’s and we went with a different company. Post cruise, I am looking forward to presenting a webinar for The Society of Australian Genealogists in August. Amidst all this, I am ‘racing’ for life, in aid of cancer research in next weekend’s forecast heat wave. So many lovely people have already parted with money; more sponsors welcome. Retirement? Remind me what that is – mind you I am still chasing official retirement age, which is receding rapidly into the unattainable distance. I know, I do take my obsession with making history accessible to children to extremes. After all, my first conversation with my granddaughter, whose birthday is 5th November, centred on the fact that Guy Fawkes was the scapegoat and she was really born on Robert Catesby Day. That said, if we want to interest young people in history and heritage in all its forms, we need to ignite that spark when they are young and I do mean very young. So here we are, the long promised post suggesting how pre-school children can be immersed in history and family history before they even realise it. Thank you for your patience. Something really simple, like playing with toys that belonged to parents, or even grandparents can start conversations about continuity – ‘that was Daddy’s when he was a little boy’. Of course, it is a while before children can understand that their parents were once children but it is never too young to start introducing this concept. Reinforcing this with family photographs, showing Mummy and Daddy getting gradually younger, can help. How about laminating pictures of special people, starting with parents, grandparents, aunts, uncles and cousins and then moving on to family members who are no longer alive? If all the toys from earlier generations have been re-homed, you might find it easier to obtain copies of books that were past favourites. Some of these will have illustrations that evoke past eras. Janet and Allan Ahlberg’s beautiful Peepo, for instance, features 1940s’ interiors. You could also provide an opportunity to play with replica toys from earlier periods. This does not involve a great financial outlay; most of these toys were home made, so you can make your own. Nursery rhymes, of course, have been enjoyed for generations and many reflect historical characters or events. Humpty Dumpty, for example, is believed by some to originate from a nickname given to a cannon at the English Civil War siege of Colchester. There have been many Dukes of York but the Grand Old Duke is thought to be James II (formerly the Duke of York) and to refer to the incident, in 1688, when his troops were marched across Salisbury Plain to combat with his son-in-law William of Orange. 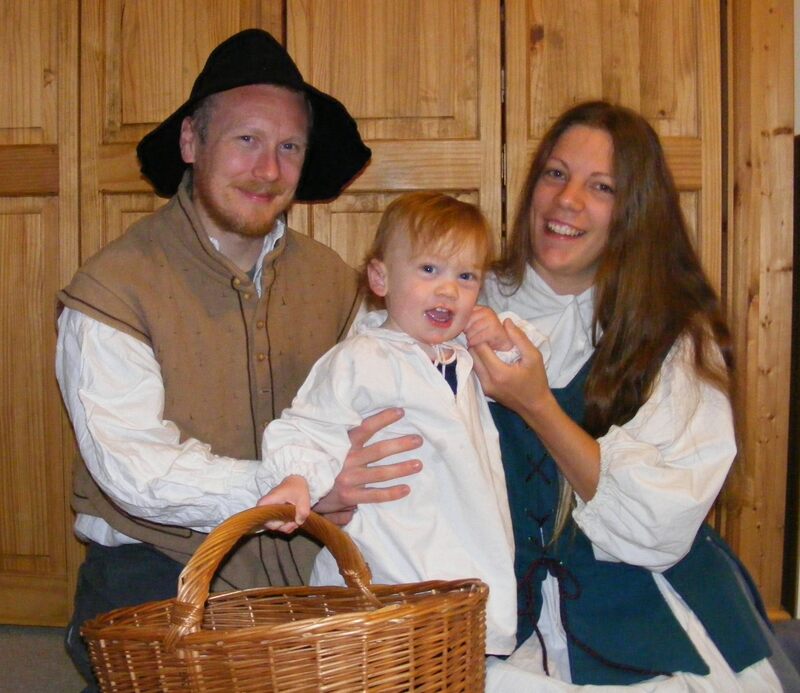 Dressing up in old fashioned clothes can be fun, remember that this includes the fashions of the 1990s! 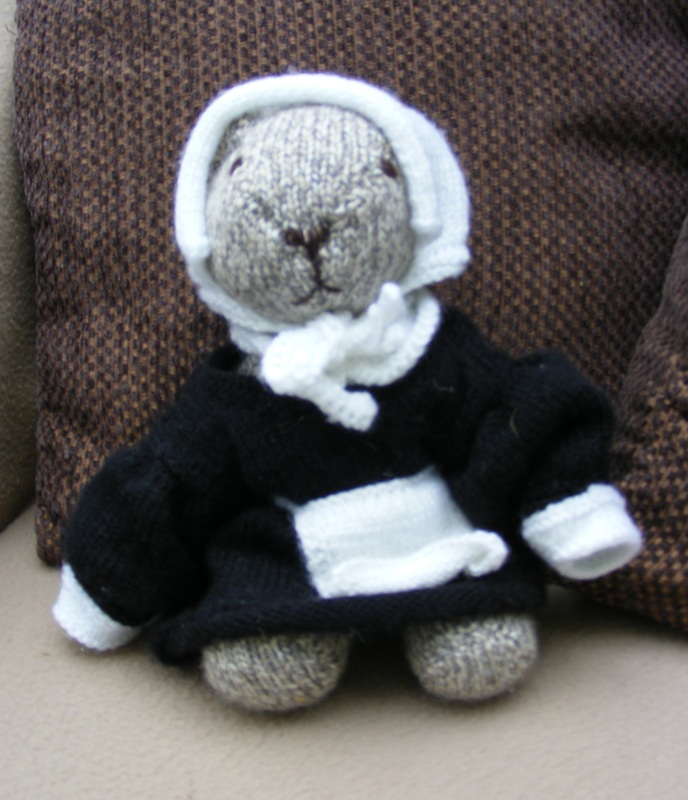 Alternatively, toys can be dressed in period costume. Even quite young children can be taken to historical sites and many of these are realising the need to be child friendly and interactive. Do not assume that you cannot visit such places with under 5s. Obviously, you need to ensure that they do not disturb other people’s enjoyment of the place and you cannot expect them to benefit from the visit unless you are willing to act as an interpreter. Talk about what you can see, even if they cannot understand what you are saying, newly verbal children just enjoy ‘conversations’. If the venue does not already have a children’s trail, invent your own. 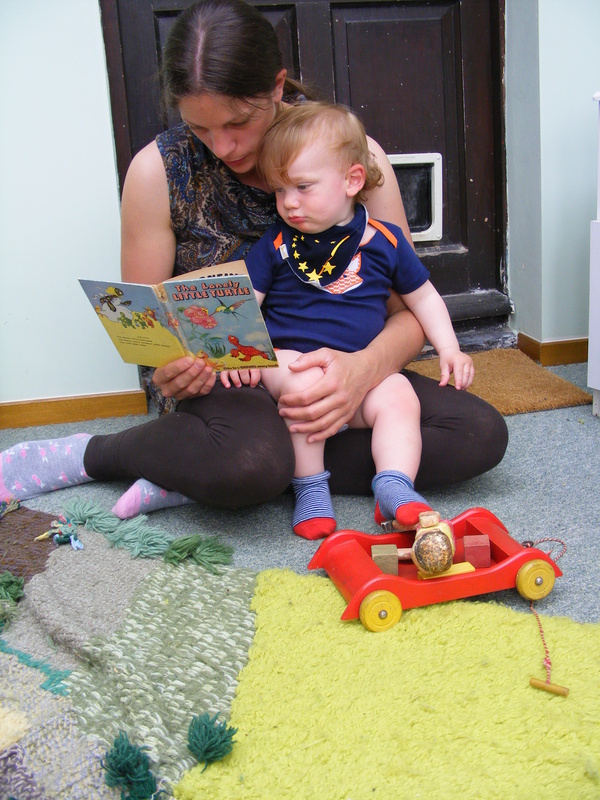 As you enter a room, look for an object that is in your child’s vocabulary and ask if they can see it. We recently had fun spotting peacocks on a tapestry with Edward (aged 16 months). If there are opportunities for hands on interaction with artefacts at heritage sites, do take them. Small world toys, such as Lego and Playmobil (other toy manufacturers are available) produce figures from the past, – knights, Victorians and so on. 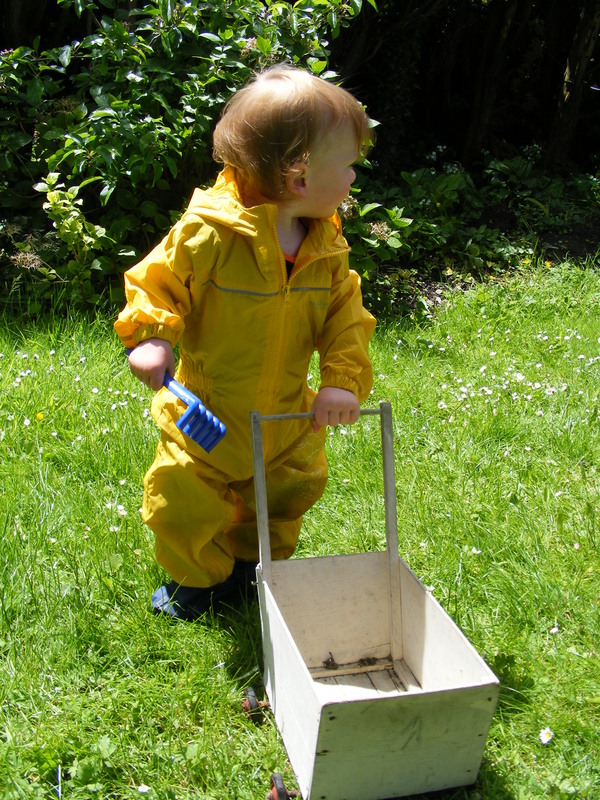 Once your toddler is safe with small pieces, these are great fun. Most small children love dinosaurs – these too are history! Remember to start to introduce the idea that dinosaurs are different from cats, cows or elephants, in that they are from the distant past. There are many more ideas and there is a booklet in preparation, finishing it is a little way down the ‘to do’ list but I will get there. Before you dismiss your descendants as not being interested, ask yourself just how hard you have tried to bring history to them at their level. After some time in Granny mode, it was off to the industrial north for the job I must not mention. We arrived from the east, having detoured via Cambridge, so approached through Longendale – a much better route than our usual crawl up the M6. Safely settled in to our motel, we descended for food. Who decided that many decibels loud rap ‘music’ was a suitable accompaniment for food? Add to that the numerous violently flashing fruit machines and I felt the need to lie in a darkened room. We are travelling with our old and trusty Sat-Nav (the new one is irrevocably attached to another vehicle), that would be an old and defunct Sat-Nav, which wimpered into inactivity on our way to the city centre. Fortunately we did have some idea where we were heading and I emerged unscathed and without requiring detours. Other incidents relating to our foray north include being attacked by the contents of a yoghurt pot, whilst attempting to liberate my breakfast. Then we went in search of a Harvester (or indeed anywhere to eat in relative peace and calm). Inevitably, the now recovered Sat-Nav does not recognise the road name, ‘Arena Approach’. Using what is left of my initiative, I spot a sign to a Stadium and think that this may be the arena that we need to approach. It turns out that this was, for once, a good move – hurrah! Our trip also incorporated a photo shoot. Now before you comment that we are hardly model potential, we were responding to a request for those who don period costume to take part in a photography project. You can read all about our brilliant time with the lovely Jo Rutherford on Swords and Spindles’ blog page but here I must mention the chair. After my mum died, precious heirlooms were divided between my daughters and myself. There has been a certain amount of reassignment of some of these possessions since then and I had just re-taken possession of a folding carpet chair that belonged to my great-grandmother. This was in the boot, along with sword and buff coat, when we arrived at the photographers. Jo spotted this and suggested that we incorporate it in some of the shots. There was something wonderful about sitting in seventeenth century costume, on a chair that was the favourite of an ancestor, in order to have my picture taken. Jo also took a very evocative picture of the empty chair. 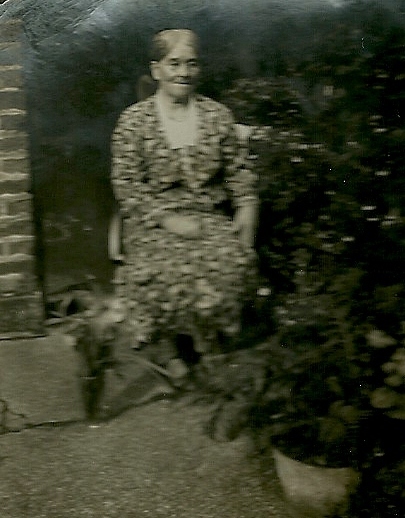 I was able to send her a picture of the chair’s owner and even a very blurry picture of great-granny sitting in said chair. Nope, I still haven’t forgotten that I promised to report back about bringing history to the next generation – patience is a virtue and all that. This week saw me give two remote presentations to Ontario Genealogical Society’s annual conference. This is always a strange procedure as I usually feed off my audience and screen-sharing my power-point means that the audience are hidden from sight. I did explain that it was their chance to sleep through a lecture without the speaker knowing – who knows how many took the opportunity? Their set-up meant that I could only hear what was being said when the speaker was very close to the Canadian lap-top and in the absence of any loud noises their end, I could not hear what was going on. It turned out that at one point they couldn’t hear me either. It seems that the lap-top that was being used lacked a power cable and the battery died. Who needs an insightful conclusion? My second talk, on one place studies, included a question from someone who, by co-incidence, was researching a place a mere three miles from where I was born. I was therefore able to give some detailed information. Fortunately no one else expected me to have a similar in-depth knowledge of their place or I may have been stuck! Also on the agenda was a very interesting meeting, on behalf of Devon Family History Society, with people looking to develop heritage provision on Lundy Island – some intriguing ideas and possibilities. The meeting was on The Oldenburg, Lundy’s passenger ship. You can only get on and off the boat at certain stages of the tide. It was touch and go whether we would escape in time. In the end we descended a very wobbly gang-plank, dodging ropes and cables, at the very last minute, Just as well we did, as then it was off to entertain Langport History Group as Swords and Spindles. I was thrilled to find that the Institute of Heraldic and Genealogical Studies have made Putting your Ancestors in their Place: a guide to one place studies their book of the month. I do hope this isn’t because they bought lots of copies that they can’t get rid of! It is being offered at a reduced price and postage free in the UK – so June is the month to buy, if you haven’t already succumbed to the temptation. More excitement, as I have been invited to present a webinar for The Society for Australian Genealogists, so I shall be talking on three continents and at sea this year. 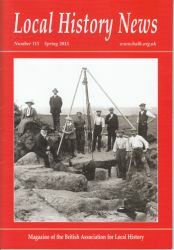 There have also been some lovely remarks about my recent article in Local History News, the magazine of the British Association for Local History. It describes how Buckland Brewer History Group have been working to take history into the community. I haven’t forgotten that I promised to report back about bringing history to the next generation – more on this soon.